Gaithersburg, Maryland, USA – June 23, 2014 - GL Communications Inc., announced today the release of its latest product LightSpeed1000™ with Channelized Emulation and Analysis of T1s and E1s - With its unique architecture, literally thousands of DS0s within T1s and E1s can be accessed directly within an optical SONET or SDH structure - with ease for emulation and analysis. Speaking to the press, Mr. Jagdish Vadalia, a senior manager for product development of the company said, “SONET SDH technology forms the transmission backbone for TDM, IP, and Wireless networks. STM-1 and OC-3 optical transmission rates (155.52 Mbps) are the most common of the various dense pipes (in SDH SONET) carrying E1, T1, E3, T3, and Ethernet multiplexed signals. He added, “GL’s LightSpeed1000™ in Channelized Mode provides such simplicity, permitting direct DS0 level access to hundreds of T1s and E1s, and in the near future all the E3s and T3s constituting the OC-3 and STM-1. 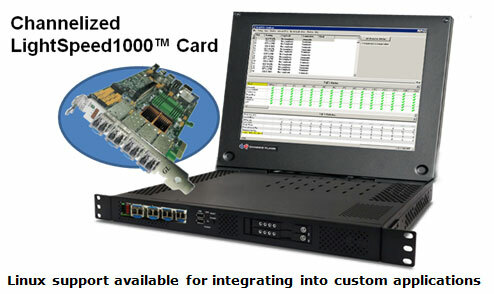 This platform with its unique architecture eliminates the requirement for external multiplexing hardware and hundreds of cables and connectors. Multiple, independent streams of any user-defined capacity can be generated internally, analyzed, and monitored in real-time. Allows direct access to anything and everything on SONET / SDH – Framing and Payload, including structured traffic (T1, E1, STS-1, DS3 etc) or unstructured traffic (ATM, PoS, etc).